A GPS in Jacksonville aimed at The French Pantry leads to a building that looks like a warehouse. Signs that you’re in the right place: the parking lot will likely be full and during the lunch rush hour, a line will wrap out the door. Brace yourself for a wait, and be prepared to search for seating among communal tables. This is what happens at a popular place that’s open just three hours a day, weekdays only. Slide along the dessert counter (perhaps counting the numerous spelling mistakes, such as “weding cake,” “chocolate croisant,” and “Napolian”) to reach an attendant who’ll take your order, knowing that the sandwich-makers will smartly prepare a quality plate for you. As in Paris, there’s a menu board with offerings laid out in cursive handwriting. That’s all the more reason to go parisien, as I did in ordering the Parisienne French Dip ($9.50). 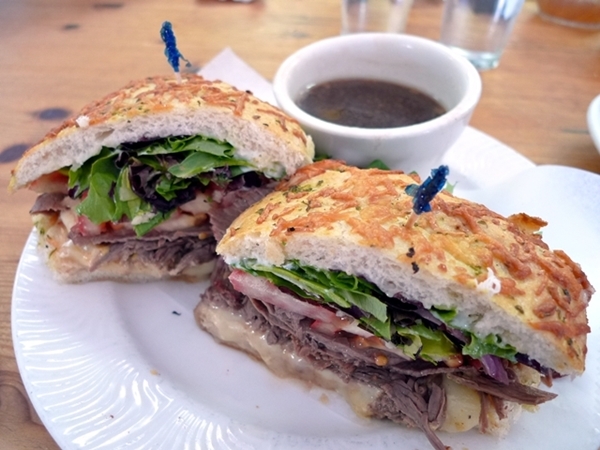 The French Dip comes on crusty herb focaccia, baked with Asiago cheese. Tucked into the bread is a generous pile of rare roast beef, along with lettuce, tomato, oozy brie, and a smear of mustard. Take out the toothpick and hold on tight—it’s challenging to dip the sandwich into the small bowl of jus. But it’s well worth the effort; the gravy is beefy and slightly peppery, bringing all of the sandwich’s components together in each bite, with the pungent flavors of the brie and mustard punching through. As if the sandwich isn’t enough, there’s more. Since The French Pantry is a veritable warehouse full of bread, you’ll also get a separate plateful of French bread with your order, accompanied by balsamic-infused oil with herbs for round two of the dipping action of your carbo-loading lunch.